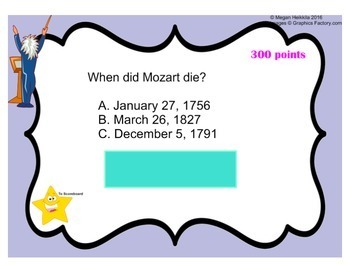 “Mozart Trivia” helps students review the most important parts about Mozart's life and music with a fun, interactive game. 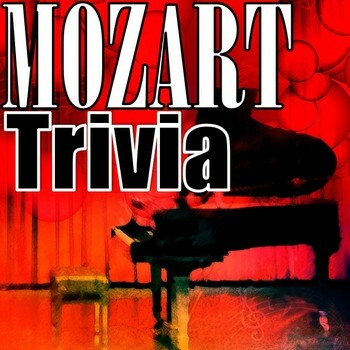 This game is made of 20 Mozart Trivia questions of varying levels of difficulty. The "Game Board" page organizes the questions from easiest (100 points) to hardest (400) points. Students choose which level they want for each question (or the teacher can go from easiest to hardest if it's too much trouble - that's what I do so I can keep up with it easier). Click on the instrument for the level question they want to try. The instrument picture will send you to that question. Give students 1-2 minutes (depending on difficulty) to answer each question and write it on their white board or paper. Drag the eighth note clip art to cover the answered questions. 1. Create a competition between your different classes. I like this way best because it allows for competition without causing unnecessary difficulties within the class. I labeled the scoreboard teams for my 4 classes. It is easy to change the names by unlocking the scoreboard and clicking on the names. You can also add or delete more scoreboards to fit your needs. I do this and create four teams within the class. The teams each write down one answer. If 2, 3, or 4 teams get the correct answer, they win the points for their class. 2. Create a competition between the class and the teacher; if they get the question right, they get the points, but if they get it wrong, the teacher get the points. I prep my students ahead of time so they are most likely to win. 3. Some classes may enjoy having two teams compete against each other. This game takes approximately two or three 30-minute classes. 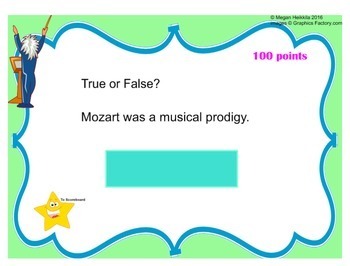 I have included a Mozart Facts page to prepare your students for the game. This lesson would be most appropriate and enjoyable for 2nd graders up to 6th grade. I hope you enjoy this fun, interactive game! 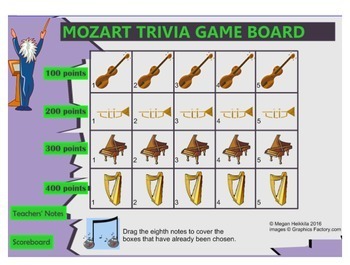 Composer Trivia games now available: Beethoven Trivia Game, Mozart Trivia Game, and John Williams Trivia Game. More to come soon! Click here to check out FaceTime with Composers - Mozart Edition for a great addition to this game by my friend Music Man of Steel! Blog - stay tuned! It will be found at megsmusicroom.com soon!